Writers, photographers and videographers vied for position at the annual Press Day at the New York Botanical Garden Orchid Show, opening March 2 through April 22, 2013 in the Bronx. I was in danger of being pushed into the reflecting pool at the entrance but managed to keep my footing. Designed by Francisca Coelho, V.P. 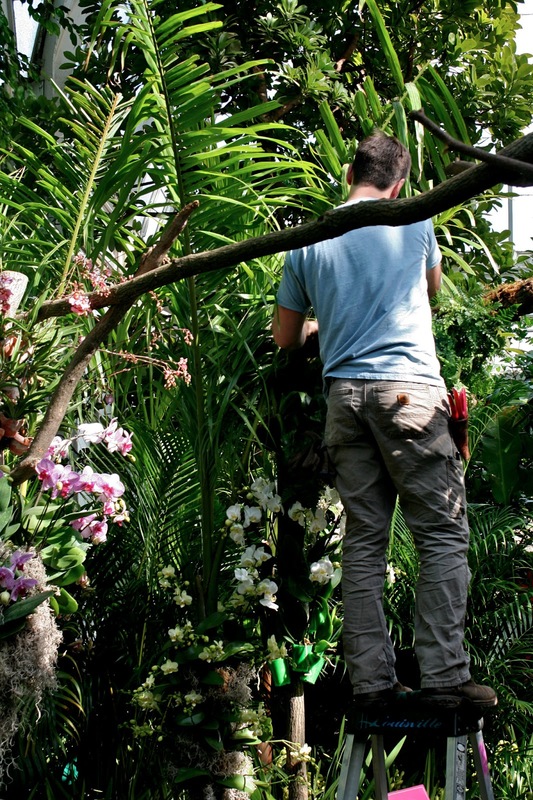 for Glasshouses and exhibitions who has opted for a naturalistic approach, this year's show is particularly pleasing as it meanders through most of the conservatory, combining orchids with other lush tropical flowers and foliage. 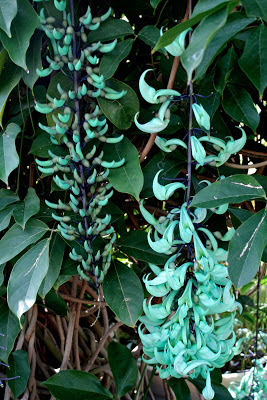 The jade vine in the pool room cooperates by bursting into bloom in time for The Orchid Show. And yes, it really is this aqua color, highly unusual in the plant world. 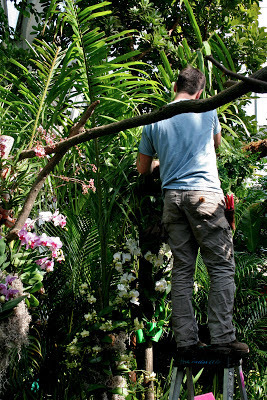 As we walk through the show, finishing touches are still being added by staff on ladders and on their knees. 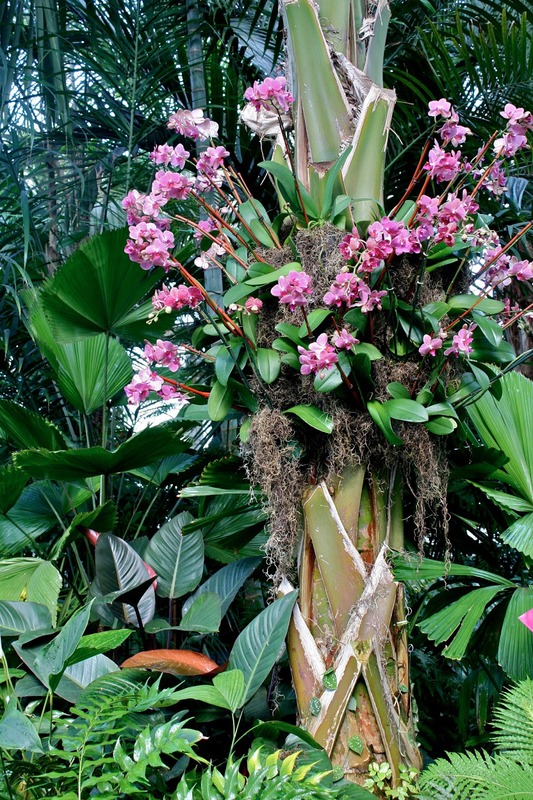 At the end of the show, plants that are not part of the permanent collection but were brought in specifically for this display, are donated to about 40 community groups who request them. For information about tickets, special events, hours, tours, visit the NYBG website. Just asking, but do orchids REALLY come in bright purple (and blue) colors??? I've seen some lately and somehow I'm skeptical! This show would have been fun to attend. :-) Have a great weekend. 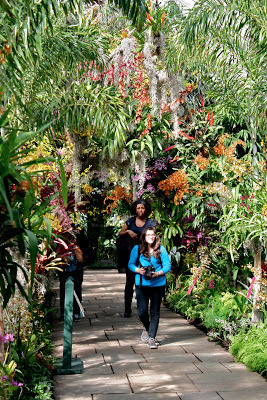 What grand photos and magnificent plants. I only regret I won't be in NYC to visit it in person. Thanks for bringing it into my New England home. 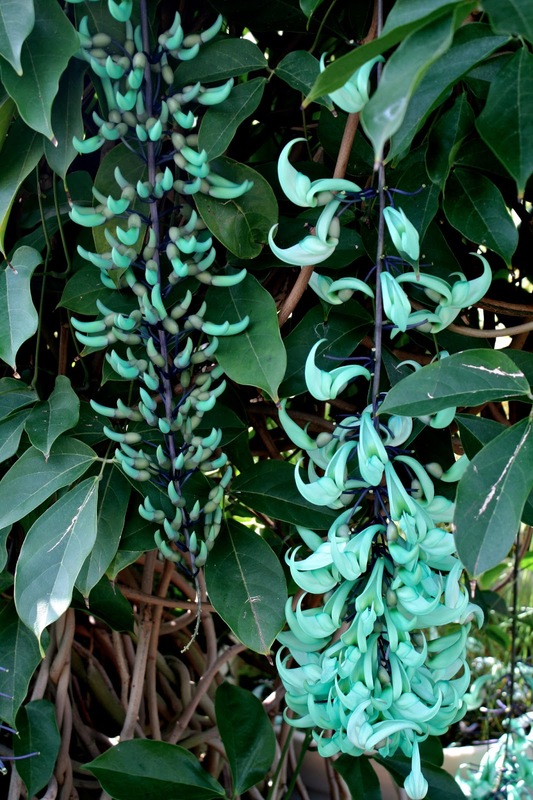 Shady, the jade vine isn't an orchid; it's scientific name is Strongylodon macrobotrys and the vine stays in that spot in the glass house even when the orchid show is over. 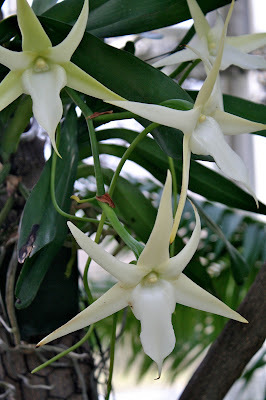 But the lead photo is an orchid and I shot the pic because the bright color drew me in. With more than 30,000 naturally occurring species, I learned that orchids are the largest family of flowering plants. Colors attract pollinaters, the way they attracted my camera. Nana, you have no excuse not to visit NYC. I know this is Other Ellen's post but you've hit on one of my pet peeves so I have to jump in. 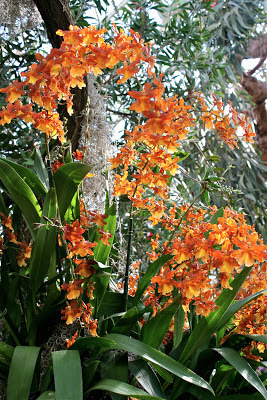 The orchid in ESP's photo is a Vanda and that is its true, natural color. It's gorgeous. It's also just about impossible for us to grow in the home (at least up here in the NE) because it requires very high light and great warmth. I bet what you've been seeing are the artificially colored Phalaenopsis orchids, which are now being sold in bright blues and purples. Growers take white-blooming Phals and feed them a dye solution, much as people do to create blue or green dyed carnations. 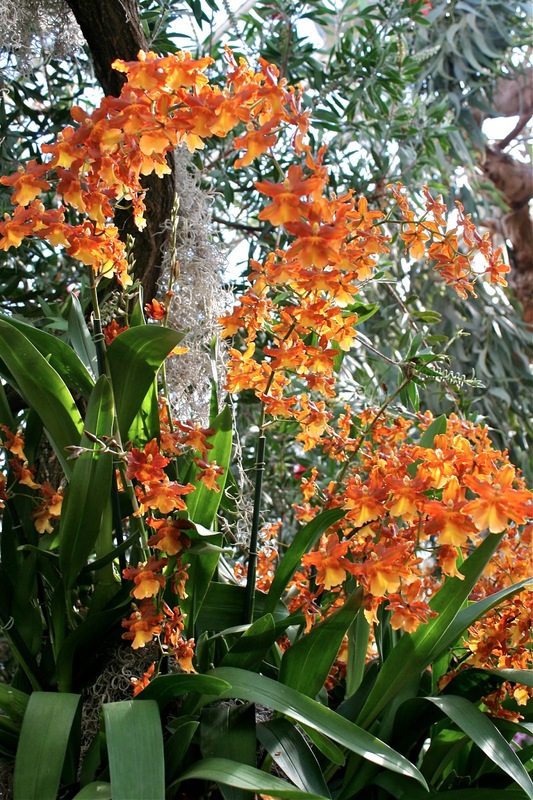 There are no Phals that are naturally blue or deep, true purple, but Phals are much easier to grow in the average home. Hence the hideous tinkering. The good news is that the next time the orchid blooms, the flowers will be their natural color...unless you feed it dye. Which I'm sure you would never do!